When it comes to cooking soup put those can openers away. The New England Country Soup Challenge showed me how it’s easy and delicious to have a hearty, creamy bowl of soup without blowing your diet. This competition pitted home cooks against the brand’s prepared soup pouches to see which competitor could create the most nutritious and delicious recipe. New England Country Soup prides itself on being able to create healthy soups with all natural ingredients to rival any home cooked concoction. All of their soups are full of large cut veggies, low in sodium and in a convenient shelf-stable pouch for the foodie on-the-run. After spending the day tasting a variety of soups including Chicken Corn Chowder, Nana’s Chicken Soup, and Caribbean Black Bean, I have become a raving fan. If y’all are interested in giving these soups a try, check out the soup aisle at Publix or you can order online. This year’s Southeastern Soup Challengers had a real test to see how their home recipes would stack up against the brand’s soups in two categories: Taste and Nutrition. The judging was tough with delicious soups like Thai Turkey Larb and Carried Away Black Bean Soup with Sweet Plantain Chips accompanied by Mojo Relish; yet, the Grand Prize winner was a comforting classic: Mushroom and Barley Soup. 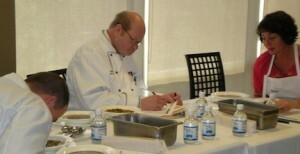 Felice Bogus, the winner and creator of this recipe, submitted her entry along with her husband, Robert, who turned in a competing recipe of his own. 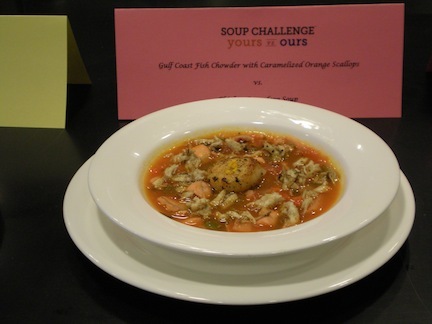 Both of the couple’s recipes made it to the final round where Richard won the prize for Best Presentation with a Gulf Coast Fish Chowder with Caramelized Orange Scallops. The happy couple will certainly be enjoying their first class weekend in Martha’s Vineyard both as winners.